Scientists and regulators from around the world warn that human and environmental exposure to per- and polyfluoroalkyl substances (PFASs) will be a long-term source of concern due to the persistence of these widely used chemicals. The group of 50 international scientists and policy makers have called for collaboration on new approaches for assessing and managing highly persistent chemicals like PFASs. 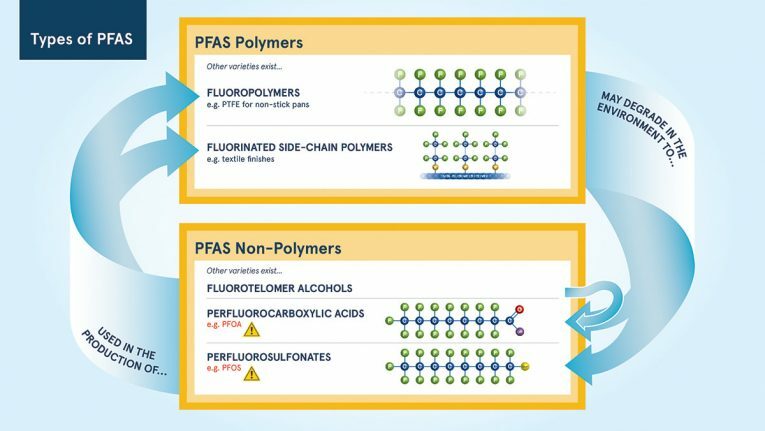 Their report highlights that over 4,000 unique PFASs have been used in technical applications and consumer products, and while some PFASs, such as perfluorooctanoic acid (PFOA) and perfluorooctane sulfonic acid (PFOS), have been investigated extensively and regulated, there is still limited or missing information about the current uses and hazards for many other PFASs. Over 50 international scientists and policymakers came together in November 2017 to discuss the need to find common ground and goals regarding how the science-policy interface of per- and polyfluoroalkyl substances (PFASs) can be strengthened. This meeting resulted in a series of recommended Future Actions, as highlighted in their communications brief. Attendees noted that due to the stable thermal and chemical properties of PFASs, they are still being used as a surface protector in a wide range of products such as food contact materials, textiles, fire-fighting foams, cosmetics and electronics. Yet since PFAS was found in wildlife and human blood samples there has been an exponential growth of research on PFASs since the early 2000s. A number of scientists, regulators and organisations are now demanding that there is an “effective and efficient assessment and management of overlooked PFASs”. Their report calls for PFASs to be looked at as a group rather than individual chemicals, due to the similar characteristics of all PFASs. The majority of participants call for there to be more available information regarding the use, alternatives to, and current and future emission sites of PFASs, which, whilst unregulated, is not easy to measure. As a result of the pervasiveness of PFASs in consumer goods, the group called for clearer labelling on products. Detailing their PFAS content or ‘footprint’ will allow consumers and retailers to make fully informed choices regarding the products they purchase or promote. A key outcome of this meeting was that there needs to be a collaborative effort to “reduce, and eventually phase out, nonessential uses of PFASs”, with further research into safer alternatives. To be able to do this effectively, it was agreed that considerably more communication, similar to the workshops that took place in November, is required between both science and policy communities to continue these discussions. PFAS is not a chemical, but a term used to describe a whole group of chemicals which have a similar molecular structure, or ‘carbon chain’, and a specific element, ‘fluorine’. There are more than 3000 types of PFAS commercially available on the world market today.